This is a great breakfast option to make ahead of time so you can grab and go in the morning. It’s a very high protein cake (9 eggs! ), contains no grains so it’s gluten free and I’ve even made an option to make this completely sweetener free. 4 cups chopped organic apples, cored and chopped into ½ inch pieces. I had extremely large apple and 2 apples made 4 cups. I think you would probably need about 4 regular size apples to get 4 cups. No need to peel the apples. Preheat your oven to 350 degrees. In a skillet, saute the apples, water, vanilla and cinnamon until the apples are the consistency of apple pie filling – about 10 minutes. Once the apples are finished cooking, add 2 tablespoons of coconut oil or butter to the mixture and stir until the oil or butter is melted. Allow the apple mixture to cool for a few minutes before adding it to the egg mixture. In a medium bowl, whisk the eggs, coconut milk, coconut flour, ½ teaspoon cinnamon, maple syrup, baking soda and salt until well combined. I just used this recipe this morning and it turned out delicious. My whole family enjoyed so it’s a keeper. Thank you! Loved the apple cake. Extremely moist. We ate it for dessert after dinner and then finished it for breakfast the next day. Good one. Keep them coming Kelly. Thank you!! 🙂 Glad you liked it! We have really been enjoying this for breakfast. I’ve made it at least 4 times now and thought it was about time I tell you that! We love this! I’ve been making it about once or twice a week for the past month and it’s so so so good! I would like to try this but want to make sure I read this right. Only one TABLESPOON and a half of coconut flour? That was exactly what I was going to ask. I’m so glad it is the smaller amount because that stuff is crazy expensive. What if I wanted to make a little less? I could not get through that much. Does it freeze well, or could I halve the recipe? Hey Jenn! Well, I just made it by halving the recipe and it came out great!! Just like the original version. I halved everything but didn’t quite halve the coconut flour or the baking soda (see below). Make it just how you would the original recipe. I didn’t have one of those cute 4×4 pans, so I used a bread loaf pan and it was done cooking at the 40 minute mark. It came out a cute little loaf (came up about halfway in the bread pan). A piece is freezing now so I will let you know about that tomorrow, but from everything I’ve been reading today, it should freeze really well. Similar recipes using eggs and coconut flour have froze well and tasted great when thawed according to a lot of people on the internet. But, I will let you know what I find out 🙂 Have a good one!!! The apple cake freezes very well! I just enjoyed a thawed piece for lunch and it takes just like the original. I forgot how much I love this healthy cake! Wow thank you so much for taking the time to work out the answers to these questions, which were exactly what I was trying to work out too! Too much to make all at once, but not sure my baking skills are up to working out the nuances of what halves exactly and what needs a little more! Same with the freezing question – would be perfect to make a larger batch and freeze for a once a week lunch box treat. I’m hoping this works out well as seems the perfect solution to kids who want what ‘everyone else’ has with a mother who refuses to add processed foods and sugar to their lunchboxes!!! I am new to the paleo-diet and was worried about what I will do when I need to get a sweet treat or bake for frendis. This is such a great solution! I can’t wait to try them! This is the best blog I have come across in a long time. Thanks Murni! That means a lot to me 🙂 Hope you enjoy the treats! This is so good! Thanks for the halving recommendations, too! I added some chopped walnuts (about 1/2 cup) and it was delicious. Next time I will try baking it in mini muffin and mini loaf pans for easy freezing. Thanks for your generous sharing! I will make mini loaves and freeze, as well. Great idea! Thanks! My apples rose to the top, too. I was thinking of grating the apples next time to incorporate them better. It tastes kind of custardy-French toast-ish. I like it, my kids are not so sure yet. I JUST made this recipe and it’s sooo good ! I replaced the maple syrup with honey and some maple butter (it’s what I had) and since I’m not a huge fan of cinnamon I put half the amount. Turns out I should have put it all in ! Simply wondering if it needs to be kept in the fridge ? We’re 3 in one fridge so I’m thinking of leaving it in our cold room…simply an unheated room and it’s winter here in Vancouver? I’m fairly new to cooking. Thanks!! Thanks Kenze – so glad you all liked it! 🙂 And yes, it should be kept somewhere cold (thanks for reminding me of that – I’m going to update the recipe and write that in there). Your fridge or your cold room would do the trick! Baked in a loaf pan (lined with parchment) for 35 minutes. Quite delicious! Awesome, Rebekah! Thank you so much for sharing 😀 I love that you included flaxseed, too! I loved this recipe, it was really wonderful. My husband liked it but commented on the egg /custard taste. Guess he is not a big fan of that. So I added a cup of almond meal, it turned out fantastic and I didnt have to alter anything else. Thanks for being open to letting us post any changes we make. Your recipes are really great. I made this a few days ago and we loved it! I added a cup of almond meal/flour as one of your commenters suggested, rather than the 1.5T of coconut flour. I used 3T of honey instead of 2T of maple syrup. It turned out great. It had a bit of that custard texture, but more bread like. Best way I can explain it, it was like a piece of French toast. We sliced it up and toasted it in the toaster oven and then drizzled maple syrup on top. SO GOOD!! Huh. This tasted like apple quiche to me. Do we have to keep it refrigerated? Maybe I did something wrong but I followed the recipe. Bummer, Kristina, apple quiche doesn’t sound so appealing :/ Yes, you do need to keep it refrigerated. This def. isn’t super sweet tasting, so you might need to add more sweetener or apples for your tastes? Just an idea if you were willing to try it again. I think it tastes more like french toast, but that’s just me. What are your favorite apples to make this with? Would something omething sweet and sour like pink lady’s be great or weird? do you typically use more sweet (gala, red), or sour like granny smiths? thanks! this recipe looks amazing can’t wait to try it! Hi Amy! I make this a lot when apples are in season here and use whatever apples are the best deal at the farmer’s market – I’ve tried it with everything from gala to granny smiths and it’s all tasted great to me 🙂 I typically enjoy a sweeter apple to bake with, but the granny smith’s tasted really good in here, too. I think pink lady’s would be yummy! Also, is the actual syrup necessary or do you think the texture would be fine if using a natural powdered sweetener? A natural powdered sweetener would be perfect. Maple was just my sweetener of choice because I love apple and maple flavors together. There is more than enough liquid in the egg so you’ll be fine with something powdered. I’d love to make this, but my son is allergic to coconuts. Is there NOTHING that can be used instead of the coconut flour? maybe like tapioca flour or sprouted grain flour? (he’s allergic to all nuts, so no almond flour either). Tapioca flour and sweet potato flour are great alternatives, but they aren’t equal substitutions and honestly, I don’t know the substitutions off the top of my head. Let me see if I can find what they are and I’ll comment back on this. But I think those types of flours I mentioned would be great options for your son. I made this last night without any sweetener. It was delicious! In the future, I will add more apples. Bacon crossed my mind too. HI, I just made the apple cake…..WONDERFUL…. I had it with a titch of almond butter on it and it’m stiil cruising with no shakes after 5 hours. This, is a keeper for sure. When I get almond flour up here via the barge order (next fall) I’ll try it with that too. I love your recipes and I’m vera thankful I found your site. Have a brilliant rest of the day. Thank you so much for your comment, Deirdre!! Made me smile 😀 You have a wonderful day as well! Makes me so happy to hear this! And you and your ironman athletes rock – that’s quite an athletic accomplishment!! I make this today and it definitely didn’t have a cake texture and had a slight egg flavor, which kind of disappointed me. Don’t get me wrong, it was delicious and I ate 1/3 of the pan myself, but it’s more like a spongy custard… which is great if you like custard/french toast, but hubby and my youngest do not. The flavor is great though. I may try again with a few less eggs and more coconut flour. This looks so great! I don’t have any apples. However, I have lots of delicious strawberries on hand. Could I replace the apples with strawberries? That sounds like a great idea! You may need to add some additional maple syrup as I don’t think strawberries are quite as sweet as the cooked apples. Or you just follow the recipe and if it’s not sweet enough for your liking after it’s cooked, drizzle some additional honey or maple syrup over it – yum 🙂 Let me know how it turns out – I think that sounds really good!! I’m a fan of all these dessert recipes you have posted, but I’m allergic to eggs. Have you ever tried your recipes with a flax meal & water egg replacement? Yes! My husband was allergic to eggs for about 6 months until we healed his gut. Most of my recipes do very well with the flax egg substitute! For recipes over 5 eggs, I found that combining fruit (usually sweet potato, pumpkin, banana or applesauce) with the flax egg substitute did the best. Hi. I really want to try this recipe but my kids are also allergic to eggs. I am not familiar with the flaxseed egg replacement option. Can you please describe what this is and what the new egg free recipe would be? Thank you so much in advance! Hi Bianca, I don’t think this will work using an egg substitute since there are soooo many eggs. Thank you for sharing! Shared with our members! I was wondering about omitting the eggs? I only eat egg whites due to psoriatic arthritis & I have changed a lot in my diet what could switch out for the egg? Thank You bunches I would surely love to try this. I made this and it seemed a little wet for my liking. I sliced it up and then put it on some parchment paper on a cookie sheet as if it were biscotti and baked it for about 7 extra minutes to dry it out/toast it a little. Therese, how was it after you put it back in the oven. It was really wet for me as well. I am wondering if I did something wrong. The fork came out clean when I tested it. I am very new at Paleo, and I am having a hard time finding foods I like. Any suggestions? Hi Linda, a lot of times gluten free baked goods have to “cure” and firm up for a few hours or overnight. You can still eat it right after it gets out of the oven, but the texture will get better after a few hours! I found it was better the next day. This was a great breakfast cake–cut it to serve 6 with ham on the side–one of our finicky teens even snuck back into the kitchen for leftovers when we weren’t looking! Has anyone tried it with egg whites instead of whole eggs? Loved this! Brought a piece to work for a coworker – she thougth it was cake. I had to show her the recipe for her to believe it was all egg. My apples rose to the top too but no biggie really – was Delish and will be making again! I just have almond flour in the house right now can I use that instead of the coconut flour? Yes, but I’d put 1 cup of almond flour in. A few readers wrote in to tell me they’ve had success with using 1 cup of almond instead of the 2 tablespoons coconut flour. I used five dates instead of the maple syrup and it turned out beautifully, just sweet enough but not too much. I could even decrease the number of dates to four. I was a bit worried putting it into the oven as it looked like an egg and apple soup but it came out beautifully. I had to bake the cake for 70 minutes, but I have an older oven and live at an elevation of 1,000 m.
Do you think you could do this without the baking soda to make it GAPS friendly? I think so Shannon. Obviously it won’t rise, but the flavor will still be great! LOVE IT! My husband thought it was bread pudding and only missing the caramel sauce. It does appear to have three distinct layers, the bottom was eggy (?) w/a rubbery like consistency, the middle was like a bread and the top, the apples. Maybe it happened ’cause I wasn’t patient enough to allow the apple mixture to cool down. Oh well, delicious nonetheless, half of it is gone and the hubby only had a small slice 🙂 I shared it on my instagram w/your website and my facebook, but was not able to tag you. THANK YOU!! Awesome, Mileni!! 🙂 So happy you guys like it and thanks for sharing. I’ll have to see if I find it on instagram – I really need to create a Primally Inspired account! You know how sometimes you see a recipe online and it looks so delicious and you can just imagine how wonderful it will be…and then it’s awful? This is NOT that recipe! It is every bit as tasty as I imagined!! This is definitely going on my “make often” list. I was getting tired of eggs, but who knew how easy it would be to eat them with cinnamon and apple. Thank you! How do I substitute almond flour for the coconut flour? Amy, some readers have tried using 1/2-1 cup of almond flour for the coconut flour with good success. I haven’t tried it myself, but that’s what I’ve been told. Hope that helps! Is it ok to Pin this using Pinterest? I don’t want to violate your copyright, but I do want to make the recipe and that’s how I catalog. Thanks! This sounds really good. Could you substitute the coconut flour with almond flour (same amount?) and have the same results or would the amount need to be adjusted! Jackie, some of my readers told me they’ve substituted one cup of almond flour for the coconut flour and it works well. Hope that helps! Best Christmas breakfast ever!! Thanks! Has anyone tried this without eggs? like using an egg replacer or applesauce? a few of my girls have egg allergies, but it looks so yummy! 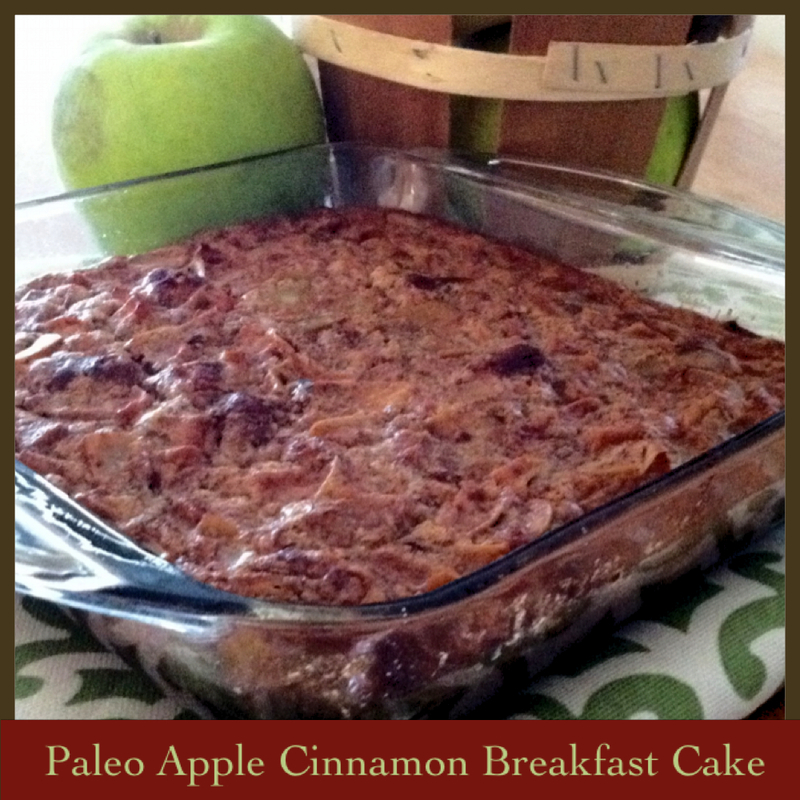 Made it this afternoon – both my brother and I are paleo and loved it! Even my mom tried and it enjoyed it. My baby cousin is also allergic to a lot of things including dairy and gluten and a whole bunch of things and this is one goodie she can enjoy!! Thanks for the awesome recipe! So excited to hear this!!! I have made this a few times and love it. Well actually I mostly make it for my 100% 18month old and he loves it! I love that it has lots of eggs. I kinda 1.5 the recipe to make enough for a week. It is a great snack too! But I was wondering if it would work with other fruits/berries that are in season? Have u tried any or have any other recipes that have lot of eggs and not much flour like this? I feel that it is a very healthy paleo recipe! Thank you! I made this a couple of hours ago and it’s turned out beautifully. The texture and taste are great, and the smell, especially while it was baking, was divine. This tasted like eggs and apples. None of my kids will touch it. 🙁 So many expensive eggs. I think this is one of those recipes that’s good if you’ve been paleo for a long time and don’t remember what actual sweets taste like. Bummer, Genie! So sorry it didn’t work out for your kiddos. Hi, sounds like a great recipe! If I can’t find coconut flour, I live in Beijing and grocery shopping can be difficult, what can I use? The gluten free is important b/c I have one son w/ Celiac. Hi Lauren, a few of my readers have written in and said they put 1 cup of almond flour in place of the coconut flour and it turned out great for them. So I think that would be a great substitute. Hi! I’m very excited to make this dish but I have a few questions first. 1. What kind of apples do you recommend? I currently have huge pink lady apples on hand and wonder if those will work. 2. Is it 2 tablespoons of flour or 1/12? I seen in previous comments someone say 1/12. Thank you!! Well! Mine came out with two separate layers… The bottom layer is salty egg and the top layer is sweet apple. Very strange! I made this using butter and maple syrup. I substituted one cup of almond flour for the coconut flour and it was delicious! My 14-year-old really enjoyed it. I did peel the apples (and used three different varieties) and cooked them until they were pretty soft. Next time, I will try adding some pecans (or walnuts). Delicious! It’s in my oven right now! Planning to take it to school for Johnny Appleseed apple tasting day. Should this be refrigerated or is it ok to leave out? Hi Kristina! It’s ok to be left out for a day, but should be refrigerated after that. Enjoy!